Murray Rothbard's greatest contribution to the politics of freedom. Following up on Mises's demonstration that a society without private property degenerates into economic chaos, Rothbard shows that every interference with property represents a violent and unethical invasion that diminishes liberty and prosperity. First published in 1982, The Ethics of Liberty is a masterpiece of argumentation, and shockingly radical in its conclusions. Rothbard says that the very existence of the state--the entity with a monopoly privilege to invade private property--is contrary to the ethics of liberty. A society without a state is not only viable; it is the only one consistent with natural rights. When it first appeared, the book was ignored by the scholarly world. Robert Nozick's treatise, taking a much softer view, was heralded instead. Nozick has since moved on to social democracy. Meanwhile, Rothbard's primary philosophical work went out of print and then virtually disappeared. Foreign-language editions have appeared, but the English version was unavailable. But times have changed. For believers in liberty, Rothbard is an invaluable intellectual asset. At last, his most rigorous argument is available again, and in the stirring prose he is famous for. In this volume, Rothbard first familiarizes the reader with Natural Law theory. After this ethical introduction, he goes on to address numerous ethical issues, showing how liberty is in the right in every case. In the final two sections, Rothbard enumerates the state's role in society as inherently anti-liberty, and details the structure of alternate theories of liberty. Murray Rothbard&#39;s 1982 classic ETHICS OF LIBERTY is not only a brilliant followup to his other classic FOR A NEW LIBERTY but is also a great and stunning masterpiece of political literature in its own right. He uses crystal-clear prose and vivid images to defend the libertarian creed as moral and ethical. He defends liberty through the natural law perspective and shows that it is moral and right and that the alternatives to the total libertarian society are inconsistent and flawed. Even when one disagrees with him (I disagree somewhat with Rothbard on the abortion issue), the thoughtful reader can and should appreciate Rothbard&#39;s awesome writing and thoughtfulness in his defense of liberty. I recommend this book to the thoughtful libertarian, anarcho-capitalist, or just any man educated in political affairs. It&#39;s really that good. In this book, Rothbard presents a strong, logical case for self-ownership, based on the unalienability of the human will. This foundation allows for a solid natural rights argument, even for those who may not believe in a "Creator" to endow such rights. In the absence of stronger pragmatic arguments, a few of the ethical theories (in particular, those regarding child neglect and nuclear weapons) are not likely to satisfy readers who are already skeptical of a pure libertarian society. The principles, however, are contiguous with the basic foundation that Rothbard lays out. 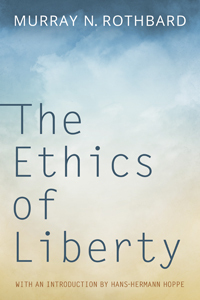 While it might not answer every possible criticism of liberty, the book provides a clear overview of the philosophy behind freedom. It presents a consistent set of principles, which can be applied across a variety of social and economic circumstances. I would recommend it to anyone looking to bolster his or her arsenal in the war between individual rights and collectivism. Murray Rothbard has produced  the equivalent of Economics in One Lesson for Libertarian/Natural Order/Anarcho Capitalist ideology. The Lesson? Natural Law property rights define Liberty. Anything opposed to natural law property rights is opposed to liberty. He then goes on to give examples and explore many of the "off limits" areas in politics ... maintaining complete congruency in application of the principles of natural law and property rights (acknowledging all the while that ethics and morals are not to be confused). This book will fill in all the gaps that remain in your libertarian political understanding and more importantly give you the tools and structured reasoning to analyze every new policy/issue for yourself in a manner congruent with liberty. Like every book on mises.org (especially Murray's) it is a must read. Does any class or interest group have the duty and burden of fighting the battles of life for any other class?